LED Blinking is a very common and almost first program for every embedded learner or beginner. In which we blink an LED with having some delay. So today we are here with the same project but here we will use an AC bulb instead of normal LED and will blink an AC bulb. When there is no voltage applied to the coil, COM (common) is connected to NC (normally closed contact). When there is some voltage applied to the coil, the electromagnetic field produced, which attracts the Armature (lever connected to spring), and COM and NO (normally open contact) gets connected, which allow a larger current to flow. Relays are available in many ratings, here we used 6V operating voltage relay, which allows 7A-250VAC current to flow. The relay is always configured by using a small Driver circuit which consists a Transistor, Diode and a resistor. Transistor is used to amplify the current so that full current (from the DC source – 9v battery) can flow through a coil to fully energies it. The resistor is used to provide biasing to the transistor. And Diode is used to prevent reverse current flow, when the transistor is switched OFF. Every Inductor coil produces equal and opposite EMF when switched OFF suddenly, this may cause permanent damage to components, so Diode must be used to prevent reverse current. A Relay module is easily available in the market with all its Driver circuit on the board or you can create it on perf board or PCB like below. Here we have used 6V Relay module. In this Arduino Relay Control Circuit we have used Arduino to control the relay via a BC547 transistor. We have connected transistor base to Arduino pin A0 through a 1k resistor. An AC bulb is used for demonstration. The 12v adaptor is used for powering the circuit. Working is simple, we need to make the RELAY Pin (PIN A0) high to make the Relay module ON and make the RELAY pin low to turn off the Relay Module. The AC light will also turn on and off according to Relay. 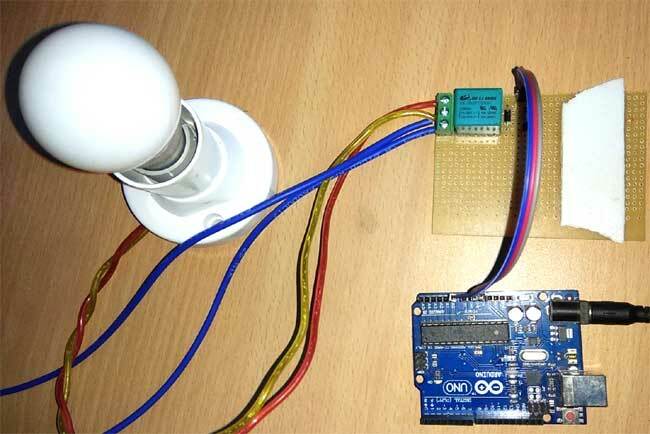 Demonstration Video and complete code for Arduino Relay Control is given below. in aurduino can we used python language to code? if possible can u send me the tutorial, to code and how to mention the pin numbers?? hi i want to light up a 12 volt LED strip and need to use a uln 2003 a and a 6volt relay and a capacitive sensor to control the light. i.e. when i once touch it it switches on, and when i touch it again it switches off. along with arduino uno. Now i am getting confused as in how shall i used= it. could you be able to help me with this. as i need to add several more componenets in future in order to learn more. make a circuit diagram Using six switches, three relays, three lights. the lights are energized when the circuit is at rest. activating any of the relays turns all three lights off. how to get ir sensor on protues software?please give your hand! dear, friend i need a relay module cod please help me!! !